Check out Tobi's Look Around Shift Dress Loving those clean lines. The Mocha Look Around Shift Dress is minimalism at its best. The high neck dress has a keyhole at the back with three buttons at the mock neck, and comes in a classic shift dress shape with deep armholes for a modern touch. You'll love this dress with a heel and statement earrings for work to drinks. Loving those clean lines. The Navy Look Around Shift Dress is minimalism at its best. 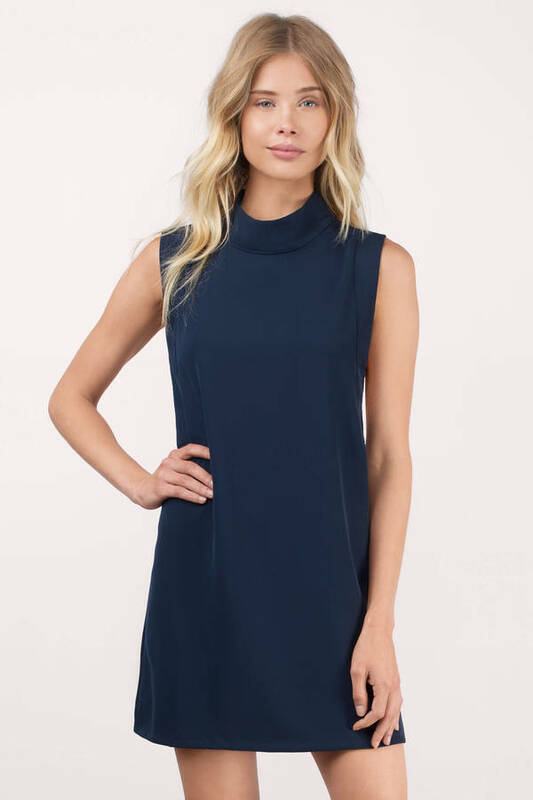 The high neck dress has a keyhole at the back with three buttons at the mock neck, and comes in a classic shift dress shape with deep armholes for a modern touch. You'll love this dress with a heel and statement earrings for work to drinks. Loving those clean lines. The Mocha Look Around Shift Dress is minimalism at its best. The high neck dress has a keyhole at the back with three buttons at the mock neck, and comes in a classic shift dress shape with deep armholes for a modern touch. You'll love this dress with a heel and statement earrings for work to drinks.